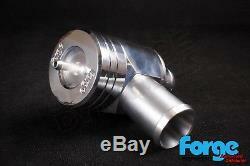 Forge Motorsport recirculation valve for the Fiat 500 Abarth T-Jet made from billet aluminium. This recirculation valve replaces the standard electronic valve. This offers improved throttle response and clamping load to maintain boost pressure more reliably and eliminates the chance of common diaphragm failure. The kit is complete with all fittings and includes a replacement solenoid and wiring harness to activate the valve to retain the engine management functionality. The valve itself is of piston design for longevity with the ability to be serviced and tuned with replacement springs if required. We use DPD 24hr service. Despatch times can vary, depending on what you have ordered. But if the item is going to be delayed longer than 24 hours we will contact you. The item "Forge Motorsport Fiat 500 / 595 Abarth Recirculating Recirc Dump Valve FMDVF500R" is in sale since Monday, October 1, 2018. This item is in the category "Vehicle Parts & Accessories\Car Tuning & Styling\Other Car Tuning & Styling".